HIGH POINT, N.C. – Guilford Technical Community College’s Pharmacy Technology Program has received accreditation from the Pharmacy Technician Accreditation Commission (PTAC). With this achievement, GTCC becomes just the 11th academic institution in North Carolina with an accredited program for pharmacy technicians. “Our program trains people to be well-rounded pharmacy technicians. 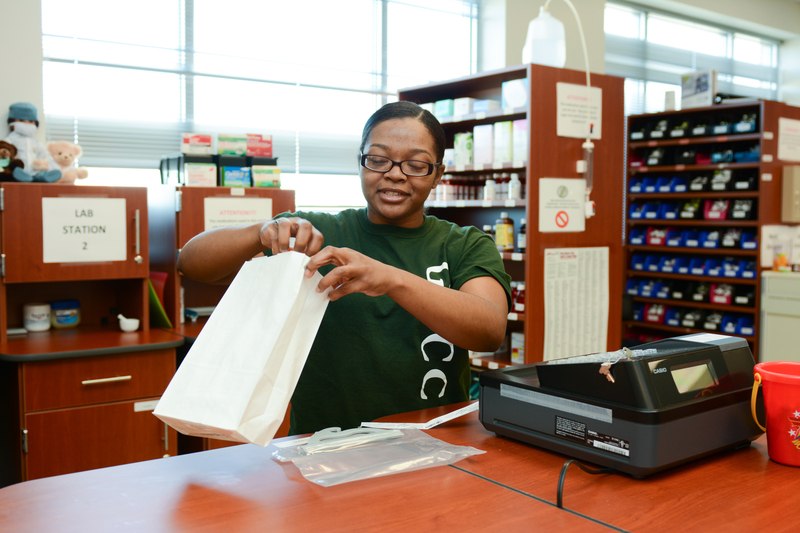 Students are offered opportunities to receive hands-on experience with clinical rotations at pharmacy retail and hospital settings,” said Tonya Welch, director of the program. Representatives from the PTAC conducted a site visit in 2017 and granted full accreditation of GTCC’s program in February 2018 for a six-year term. The program curriculum includes a mix of online, classroom and lab coursework. Students receive hands-on skill development, computer and tablet experience, and gain real-world experience training with retail pharmacies, home health care and hospitals. “We have a simulation lab where students learn how to operate in both retail pharmacy and hospital environments,” said Welch. GTCC’s national accreditation comes in advance of a new requirement announced by the Pharmacy Technician Certification Board (PTCB). Effective Jan. 1, 2020, pharmacy technicians will be required to complete a PTCB-recognized education or training program. GTCC is already helping technicians and area employers comply with the future requirement. Amanda Massie, a 2018 graduate of the program, came to GTCC to obtain her associate’s degree in order to meet employer requirements for job applicants. “It helped me get a job right away,” she says. With her successful completion of the program at GTCC, Saintsing can now transport her qualifications across state lines. GTCC will hold an open house May 30 from 1 p.m. to 8 p.m. at the High Point Campus for prospective students and working professionals interested in the program. The event will be held in building H5, room 308. Registration for the course is now open and advanced standing is available for qualified students. For more information, contact Tonya Welch at tpwelch@gtcc.edu or 336-334-4822 x55079. Guilford Technical Community College is the fourth largest of 58 institutions in the North Carolina Community College System. GTCC serves more than 35,000 students annually from five campuses and a Small Business Center. Learn more at www.gtcc.edu. The PTAC is a collaboration between American Society of Health-System Pharmacists and the Accreditation Council for Pharmacy Education and serves as the accrediting review committee for pharmacy technician education and training programs. The organization plays an important role in assuring the quality of pharmacy education as the need for standardized, quality, accredited training of technicians continues to be recognized by employers and pharmacists. GTCC’s Pharmacy Technology Program prepares individuals to assist pharmacists in various tasks that a technician can legally perform and function within the boundaries outlined by a pharmacist. Students enrolled in the program learn how to prepare prescription medications, mix intravenous solutions, and other specialized medications, update patient profiles, maintain inventories, package medication in unit-dose or med-card form and gather data used by pharmacists to monitor drug therapy. Graduates of the program are often employed in retail, hospitals, nursing homes, research laboratories, wholesale drug companies and pharmaceutical manufacturing facilities.